It's never too late to develop a new diary insert format is it? We have often heard people bemoan not being able to separate month inserts so they can either archive them or interleave monthly inserts with weekly or daily inserts. So to combat this issue we have put notes pages on the reverse side of the monthly print outs. If you don't want to interleave your monthly inserts or you don't archive them then continue to use the regular monthly inserts we have already made available. You can download prepared 2013 sets in either the Month on One Page version (Word document or PDF document) or the Month on Two Page version (Word document or PDF document). If you want to tinker, then you can download the source files. Starting with the Word files, choose between the Month on One Page version or the Month on Two Page version. With either, you'll need the Excel data file as well. Depending on what version of Word you're using, Word may put section breaks between every record, which will throw out the mirrored gutter formatting in the layout. If it does, the solution is quite simple; do a find and replace on section breaks (^b) to remove them all. But if all you want to do is change a font or a font colour, you can download the prepared 2013 set and perform a format find and replace in Word. This link will show you how. Also see the videos on the Diary Inserts page. Additionally the Personal size on Personal Paper Month to a Page and Month View have also received the same treatment. For tips on printing on to Personal Size paper please see this instruction post. As with the Personal size we are also making the source files available. Starting with the Word files, choose between the Month on One Page version or the Month on Two Page version. With either, you'll need the Excel data file as well. Is there a reason why the month labels switch sides? 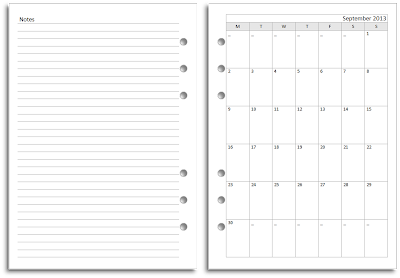 Surely once it's printed, the month will always be on one side and the notes on the other, so the month label on the diary bit should stay either to the right or the left. 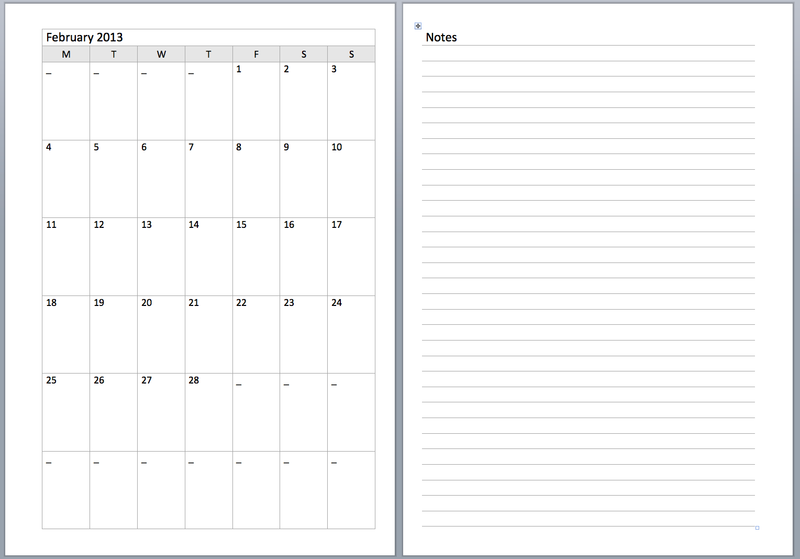 In your diagram, you have the notes on the left so it makes sense to have the month label right justified. Or am I missing something...? Good point. We'll fix it and update shortly. Hi Ray, any chance you could generate the month to two pages one so that the week starts on Sunday? I tried to do this for anothe calendar of yours but I can't work it out. Or, try to explain to me how to change it, so that I can generate other calendars too. (Be warned, I'm a sleep deprived Mum that doesn't even know what day it is, I may not comprehend despite the best of instructions.) Thanks for sharing all these great calendars by the way!!!! I'm not going to rule it out, but that's a much bigger change than it might seem, requiring the data and merge fields to be completely restructured. I'll keep it in mind, though.